A couple of weeks ago a company called Kiss Me Organics offered to send me a container full of organic matcha powder to review. Naturally, I couldn’t refuse. Ever since making matcha macarons one year ago (give or take a day), I’ve fallen in love with matcha. In fact, the week after I made those matcha macarons, I made a chocolate and matcha entremet cake… with matcha macarons. In the past, I’ve recommended buying lower grade matcha for cooking and baking. Lower grade matcha is made from older leaves and has a stronger flavour that refuses to be masked by anything. On the other hand, higher grades of matcha (like Kiss Me Organics’ matcha) have less chlorophyll so the flavour is not as strong. I thought that this was a problem a year ago. However, I’ve changed my mind. Higher grades of matcha are good for baking too. For me, lower grades of matcha are just too strong. A couple of weeks ago I made matcha marshmallows with the matcha from another company and they tasted like grass. Yes, I could’ve simply added less matcha, but then I wouldn’t have gotten a vibrant green colour. From now on, I’ll be using higher grades of matcha for baking—the price difference is only a dollar or two and I prefer the flavour more. I considered a few different matcha-flavoured desserts for this post and settled on green tea ice cream. Technically, I think this is gelato because of the use of cornstarch and whole eggs, but I hardly think it matters as long as it tastes good. I’ve had trouble with homemade ice cream before, as it often turns out icy and hard. This time, however, I modified a recipe for artichoke gelato from my friend Anna and it turned out splendidly. Anna’s recipe is great for home ice cream makers that aren’t capable of whipping in large amounts of air like industrial ones. P.S. If you’re looking for matcha for this ice cream Kiss Me Organics is a great option. I can’t speak to the health benefits they have written all over the package, but its flavour is very nice. I prefer it over the matcha that I have from David’s Tea. 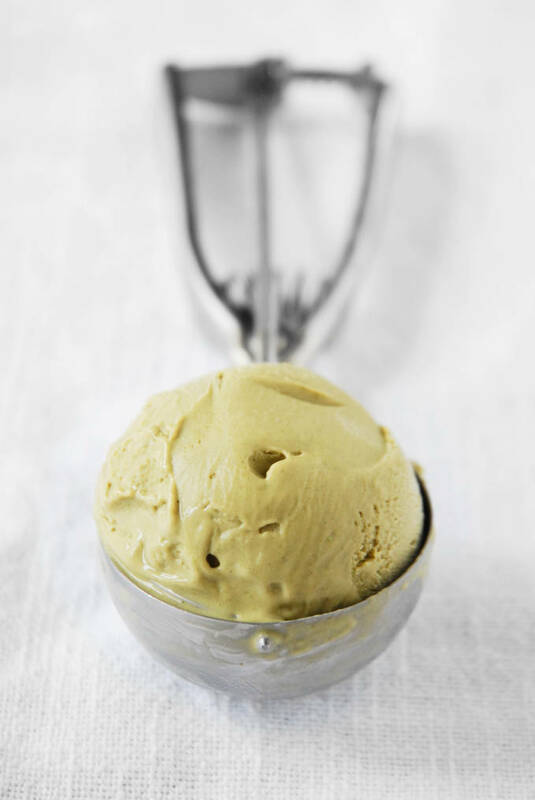 Super creamy matcha green tea ice cream, or gelato if you prefer, can be made easily at home! Beat together the eggs in a large bowl. In another bowl, whisk together the sugar and cornstarch and then whisk into the eggs. Meanwhile, bring the milk and cream to a simmer in a medium saucepan and then whisk in the matcha until smooth. Slowly pour the simmering milk and cream mixture into the egg mixture, whisking constantly. Transfer back to the saucepan and cook until thickened. Pass through a sieve and put into a container to chill in the fridge overnight. Stir in the vodka and salt. Churn in an ice cream maker for 15-20 minutes, until the ice cream is the consistency of soft-serve. Then, place in the freezer for at least a couple of hours before serving. If the ice cream is hard once you take it out of the freezer, let stand for 10-15 minutes before scooping. Now this is a delicious ice cream recipe! Also I want to top my scoop with your macaroons. That’s allowed, right? Matcha is a always a great choice for desserts. I’m sure this ice cream/gelato tastes much better than that which I used to get at Chinese-style buffets. Have you ever tried matcha cupcakes? 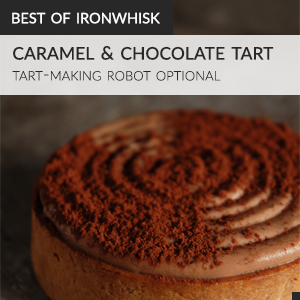 They’re darn delicious too–depending on the recipe and its execution. I’ve only tasted matcha ice cream once and said to myself I should try that at home but I haven’t. I’m going to try your recipe. It looks yum. Hi I have a question regarding chiffon cake as have recently come across your tutorial on this cake. After beating the egg white to stiff peak I still see some egg white in liquid form on the bottom of the bowl. I did not use cream of tartar. Could this be the reason? Hi Wendy! No, it sounds like the problem is that your whisk isn’t going close enough to the bottom of the bowl. I do enjoy green tea ice cream and your match version looks really creamy and delicious. I adore that photo too, you really captured the creaminess (which is difficult to capture) as well as the composition is very unexpected! Good looking ice cream..! Love the color. Can’t wait to try making this for a dinner party – but one question: All of the ingredients are measured in grams, and I’m more accustomed to fluid measurements. Do I literally just weigh all of the ingredients for this recipe – including the liquids? This was absolutely amazing! I served it with Black Bean Brownies – and it was a huge success! I used 6g of a “lesser” matcha, and 6g of a “premium” matcha – beautiful colour and no bitterness! Thank you again for sharing this recipe – it’s one I’ll be revisiting frequently! You should try green tea frozen yogurt. It’s awesome. Really easy to get sick of green tea ice cream.